REGINA, Sask. 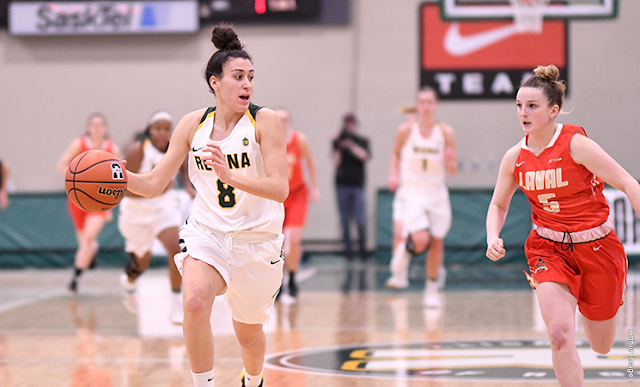 – The University of Regina’s women’s basketball team went on a huge 18-4 run in the second half to pull away from Laval for a 76-56 win on Thursday night in a U SPORTS Championship quarterfinal matchup at the Centre for Kinesiology, Health & Sport. The win sends the No. 2-seeded Cougars to the semifinals on Saturday night. The Cougars led nearly from wire to wire, though it was a one-possession game as late as with two minutes left in the first half. But Regina set the tone for what was to follow, as Michaela Kleisinger drilled a triple and Carolina Goncalves and Charlotte Kot had buckets on back-to-back possessions to give the Cougars seven points in under a minute and a 36-27 lead at the break. Carolina Goncalves came off the bench to lead the Cougars in scoring, ending up with 15 points while also chipping in with seven rebounds. Kyanna Giles and Charlotte Kot both had 14 points, with Kot’s nine rebounds leaving her just short of a double-double. Kleisinger added 10 points, giving the Cougars four players in double figures in scoring. Jane Gagné had a game-high 19 points for Laval, while Claudia Émond added 13 points for the Rouge et Or. Laval will now move to the consolation side of the bracket. They’ll play in 7:00 game on Friday night. NOTES: The Cougars advance to the semifinals for the 12th time in 19 appearances at the national tournament ... Regina improves its championship record to 4-2 over Laval and have now defeated the Rouge et Or in three consecutive U SPORTS Championships. Oops the border stops at Davidson. The Huskies might as well be from St Mary's.